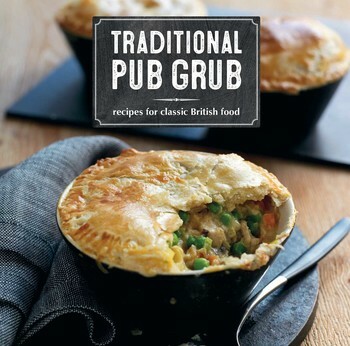 A mouth-watering selection of classic British comfort food for all the family—from toad-in-the-hole and Lancashire hotpot to summer pudding and shortbread. Ideal recipes for afternoon tea, lunch with friends, mid-week dinners or relaxed entertaining. Sample the best of British with this one-stop guide to traditional British fare. Pies, roasts, casserole, and afternoon tea treats—all the old favorites are here. Take inspiration from Soups, Appetizers, and Snacks, and make a Leek and Potato Soup to warm you up on a cold winter’s day. Tuck into an authentic British Fish Supper from the Fish chapter and imagine yourself on a windy pier on the southern coast of England. Poultry and Game is full of hearty entrees. Nothing beats a Traditional Roast Turkey complete with all the trimmings or some succulent Marinated Roast Venison. For an unbeatable Meat dinner, devote some time to making a favorite Sunday lunch—Rolled Pork Roast. No wholesome meal would be complete without something On the Side. Try some crunchy Roast Potatoes or Yorkshire Puddings. End your authentic dinner with a comforting Bread and Butter Pudding from the Desserts chapter. Then for Teatime—the epitome of British culinary tradition—make some Scones with Clotted Cream and Strawberry Jelly. Finally, fill your Pantry with essentials, such as Plum Chutney and Lemon Curd.